Why Somatic Plant Cells Start to form Embryos? Embryogenesis in plants is not restricted to the fertilized egg cell but can be naturally or artificially induced in many different cell types, including somatic cells. 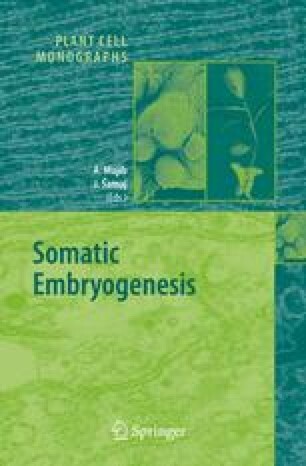 Although genetic components clearly determine the potential of species/genotypes to form somatic embryos, the expression of embryogenic competence at the cellular level is defined by developmental and physiological cues. Competent cells can respond to a variety of conditions by the initiation of embryogenic development. In general, these conditions include alterations in auxin (exogenous and/or endogenous) levels and evoke stress responses. Recent experimental results in the field of developmental and molecular plant biology emphasize the role of chromatin remodelling in the coordination of overall gene expression patterns associated with developmental switches. It can be hypothesized that the initiation of somatic embryogenesis is a general response to a multitude of parallel signals (including auxin and stress factors). This response includes, in addition to cellular and physiological reorganization, the extended remodelling of the chromatin and a release of the embryogenic programme otherwise blocked in vegetative cells by chromatin-mediated gene silencing. In this review I attempt to give a general overview of experimental results supporting the aforementioned hypothesis, leaving the detailed elaboration of special subjects to other chapters. The research reported by the author was supported by grants BIO-00080/2002 and OTKA T34818. The author is also thankful for the support of the János Bólyai research fellowship.